[PDF] Machine Elements: Life and Design (Mechanical and Aerospace Engineering Series) | Free eBooks Download - EBOOKEE! Description: Focusing on how a machine feels and behaves while operating, Machine Elements: Life and Design seeks to impart both intellectual and emotional comprehension regarding the life of a machine. 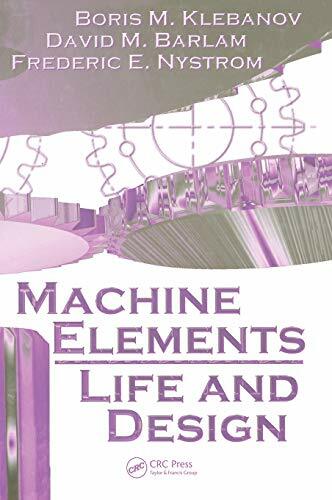 It presents a detailed description of how machines elements function, seeking to form a sympathetic attitude toward the machine and to ensure its wellbeing through more careful and proper design. The book is divided into three sections for accessibility and ease of comprehension. The first section is devoted to microscopic deformations and displacements both in permanent connections and within the bodies of stressed parts. Topics include relative movements in interference fit connections and bolted joints, visual demonstrations and clarifications of the phenomenon of stress concentration, and increasing the load capacity of parts using prior elasto-plastic deformation and surface plastic deformation. The second part examines machine elements and units. Topics include load capacity calculations of interference fit connections under bending, new considerations about the role of the interference fit in key joints, a detailed examination of bolts loaded by eccentrically applied tension forces, resistance of cylindrical roller bearings to axial displacement under load, and a new approach to the choice of fits for rolling contact bearings. The third section addresses strength calculations and life prediction of machine parts. It includes information on the phenomena of static strength and fatigue correlation between calculated and real strength and safety factors and error migration. No comments for "[PDF] Machine Elements: Life and Design (Mechanical and Aerospace Engineering Series)".